"Great interface, slow customer service at times, responsive sales team"
Our business has really taken advantage of the 'Ask a Question' feature. If there are questions about what's happening with our products, it get's posted in Bloomfire, people receive an email with the question, and anyone who has the answer can respond. All of this is collected in one place, rather than that knowledge getting lost in emails or instant messaging. There are a few minor design issues. For example, I didn't find it very intuitive for how to download an asset versus performing other functions in the system. For downloading, you have to hover over an icon. Other actions, such as 'comment,' 'bookmark,' and 'share' are labeled more clearly. The download action is not clearly marked. Even when you hover over the icon, there is no label. Not a major issue, but I've seen the question come up time and again. Prior to Bloomfire, we were storing documents in three or four different places. This is providing a central repository for everything across the entire business. We also have a second version that we use for publishing content to customers. "Very handy tool for knowledge sharing and collaboration"
Easy to find relevant topics and content via built in search engine and tags. It's also easy to sort and filter content by groups, categories and contributors. I like that as a contributor I can write one article or multiple articles and organise the in "series". Multiple people can contribute on a document by sharing questions, answers and comments which is great. The company I work for has 5000+ employees and Bloomfire both helps us get updated and keep on the same page. Bloomfire served me and the team quite well so far. I've been using it for 9 months only and there is not much I dislike so far. It is not all that easy to organise a single repository where all team members would naturally go to search for product releases, updates and general knowledge database. Bloomfire helps exactly with that and in a seamless way. In my date to day job, it is very easy for me to find content I need and it takes no time to do that. "Excellent internal Knowledge Management software"
Bloomfire is so simple and clean - it's easy for users to figure out and it's easy for admin to set up and maintain. The company has their sales, onboarding, and support processes dialed - when you send a support ticket, you get an answer promptly, and in my experience, most tickets are resolved same day. 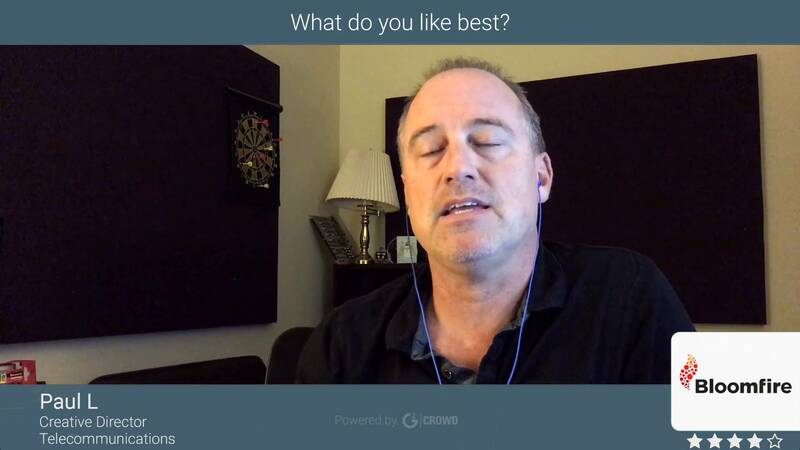 The features of the tool are super useful and relevant: search is amazing, the screencast tool is almost life-changing, and all the small features like Bookmark, Bump to Top of Feed, and Interests are terrific. The only thing we've struggled with is the lack of true document versioning, but the recent duplicate document/media feature has helped with that. We chose this tool because of its simplicity - if you want all the bells and whistles (like chat, messaging, social aspects, etc. ), this tool is NOT for you. If you want a clean, easy-to-use software for sharing what company knowledge, sales tips, and trainings, this tool IS for you. The customer support team is incredibly knowledgeable and eager to help - they were a great resource through the entire process and have continued to be a helpful part of implementing and maintaining Bloomfire. We have a lot of teams doing similar things and not collaborating well - Bloomfire has helped break down silos across teams. We've also had a hard time with shared document storage on Google Drive - Bloomfire has opened up sharing in an engaging, easy-to-use way. "Bloomfire solves our knowledge base needs"
Bloomfire or my BF as I call it, has brought great success to my team and whole department. Before BF, we had documents scattered across many locations, some even in personal folders being in a silo. We have moved not only all of our documents, but individual knowledge has also been posted in BF. This allows the team for a quick way to find answers or ask questions to the community to get answers. Zendesk, our ticketing system, is even interfaced with BF to allow the user to create a quick article from anything they might have learned from a Zendesk ticket. The main complaint I have about Bloomfire is the layout on the screen. Everything is marginalize in the middle leaving a lot of real estate to work with. By widening that area or better yet, allow to customize that area, the contributions would look a lot better especially ones with document viewers. The other thing I would like to see would be a better way to inject images into the post without having to attached it separately - streamlined. You can sort of do this with HTML. You can't beat their search engine and amount of space per post allowed not to mention the unlimited amount of space overall. We are solving our problem of not having a centralize repository of all knowledge whether that be how to guides or training documents or just individual notes. It gives everyone a quick way to search and find what they need and get the answers they are looking for. "Bloomfire enables knowledge sharing with powerful curation features and simple UI"
The platform is simple and demonstrates value quickly. The team at Bloomfire does a great job of thinking beyond the platform and providing materials and customized advice about how to implement their tool effectively. What stood out to me about Bloomfire from a content management perspective was the many ways they make it possible to group content. The Series feature in particular is fantastic and, altogether, I'm confident that their focus on enabling knowledge curation will contribute to the long-term success of using their knowledge management solution. I would like to see more transparency and communication from the Bloomfire team regarding their development roadmap. They are eager to hear feedback and new ideas for the product, which is great, and I'd love to see them take it a step further by sharing their development plans with their user base more consistently. I believe that they are working toward being more transparent, and I look forward to seeing what they come up with! If your goal is to enable knowledge sharing in a centralized platform at your organization, Bloomfire is worth assessing. Lack of clarity about what constitutes a final solution/decision. The ability to select an accepted answer to questions in Bloomfire has motivated us to take seriously the process of making sure outstanding issues get resolved. Important discussions & discoveries getting lost in email. Having one centralized place for knowledge to go & be found saves headache and angst and, ultimately, time & resources. When it goes down sometimes. it makes it hard to have to wait for the right answer when we use it everyday and things change so much in our company so it makes it worth it. As stated above, I love this thing. Its helped me know everything that has been updated simply by searching and we no longer have to have a thousand papers and dig in our desks to find it. Now all our work is at the tip of our finger tips..
"A great place to collaborate and curate assets in a fast paced technical sales organisation"
Bloomfire allows me to publish my assets and ideas to the wider community so that we can drive efficiencies and reuse across our community. It is easy to use, easy to give and receive feedback and really stimulates the conversation with on deeply technical topics with your peers. I use bloomfire all the time and would be much worse off with out it. I have to say, there is not much I don't like about the platform. It has a good design, it's easy to use, simple to search, integrates well with document sources. "Communications Management for growing Customer Success Team"
Bloomfire allows our growing Customer Success team to collaborate, share best practices, and fun tips & tricks. The digest feature allows users to control the frequency of updates and has significantly cut down on our internal emails. The workflow for posting new content changed recently, and several of our posts did not include header images. We went back in and updated since we were missing all of the dog and baby memes! We have significantly cut down on the number of internal emails and Bloomfire allows us to save content over a longer time period than our email retention policy allows. "Bloomfire will save you time and money!" Search for documents and articles with ease. The subscription is a little high. There open source options that aren't as user-friendly. I think the price could be reduced. It is a little expesive but its easy to use and has saved my company money and time. creating articles is easy and fast. Bloomfire is a depository of documentation and how to articles created by your staff. Mainspring uses Bloomfire as an archive of solutions that our company faces on daily bases. Bloomfire reduces time spent researching solutions. "A nice place for all collateral to live"
I used to have to search through all my emails for important marketing collateral or recordings of our sales meetings but now all of that info lives in Bloomfire. The ability to search through all the content in Bloomfire is amazing. We no longer have to repeatedly send out content to appropriate people - it now lives in one place forever. "Great repository but a very opinionated knowledgebase"
Organization of content and types is very useful and makes it easy for users to understand. The ease of content creation has also been very helpful in getting all our users to author things. Permissions and data architecture is not aligned with the way we work. Groups act as the boundaries for information and cause posts to end up in multiple places. The result is disparate answers to the same question which cannot be brought together without an added cost. 1) Defining the structure of the knowledge base your organization needs without the tool in mind is paramount. Changes to the Bloomfire platform make the structure a bit more fluid, but any solution chosen here should fit your org. I do not believe that your knowledge should be restructured to fit the tool. 2) Get your knowledge organized while looking for a provider of a solution. We were delayed on launch due to internal timelines related to getting info into the system. Bloomfire offers services to help, but having everything organized first will help in those conversations greatly. Storage of our business' collective knowledge. Documentation of our business processes. Forum to answer product, operational or market questions as they relate to our business. Each of these problems have been solved with Bloomfire. The largest realized benefit is the fact that this is now our collective brain. If we know something, it is in Bloomfire. That we do not need to navigate various systems is amazing. "Bloomfire delivers support documentation and sales materials to our entire staff worldwide." The search in Bloomfire is fantastic. Between the titles, categories and tags most things in our knowledge base are easily found. Add in the ability to search within PDF files and transcribe our videos and the platform stands alone. I really like the easy of use in creating new content. We can upload almost any file type and have Bloomfire display it on our desktops or mobile devices accurately and without having to reformat our content. The cost per each user. Everyone in the company loves Bloomfire but the cost prohibits us from giving everyone a membership. We tend to have to share logins for some offices and departments. The other thing is the Tags. this is kind of clunky and allows you to basically enter in anything, misspelled and fragmented words, etc. There needs to be some form of tag management as well as a way to enforce the data integrity of tags. Categories can also use to be improved upon similar to tags. Looking at the competitors products, there was really only one choice. Bloomfire is leaps above the others we tested. Ease of use and roll-out to employees is effortless. We have eliminated the constant back and forth of outdated documents by having everything referenced on Bloomfire. We no longer have international representatives using out-dated sales materials of product quotes. We delivery up to date documents to our people and sales staff directly through the platform and allow them to download content to have when they are in remote locations. "Excellent Platform for Knowledge Sharing"
An easy access to articles on different knowledge areas of our software. Search capabilities that generally yield the most appropriate results. A clean, easy-to-use interface. None so far for any of my use cases. I have been satisfied with the product. We have no worked with any of Bloomfire's competitors in the marketplace, and their product replaced a series of notes, google documents, and general knowledge in the heads of our customer success team. This platform has allowed us to centralize knowledge, search (instead of ask) for answers/solutions, interact with one another with questions, etc. It has greatly streamlined our ability to train and retrain employees. Finally, it has increased our knowledge capabilities and standards dramatically. "A wiki solution that isn't a wiki"
Simple easy to use layout. User-friendly UX that requires very little training. Super powerful search allows you to find what you are looking for very quickly. Groups allow you to divide user groups and information that may not be relevant to all users. Great support team to work with who are always making improvements and collaborating with the admins and instance owners. If you are looking for a great easy to use knowledge hub, I highly recommend Bloomfire. The way the platform works is a great combination of social media, online shopping and wiki site. together this makes it really easy to use for almost any user. Frontline and contact center training and knowledge sharing. We are now able to have one hub of all our different product information as well as a location for Marketing to communicate new promotions to our front line sales team. This means both the sales teams get what they need and the marketing team has the reassurance of alignment on communication to guests and customers on all fronts. "Bloomfire is a Helpful Resource "
Bloomfire is my go to for any questions I have related to product knowledge or technical issues. It has a user friendly platform which makes it easy to find information. Occasionally I am unable to find searched information because of how documents have been titled. Bloomfire is helping to educate me, as I am less than six months in my new role. I feel more confident talking to customers having Bloomfire to search for questions. "Bloomfire = LifeSaver #elevateknowledge "
Bloomfire allows the company to keep all content in one place. It is extremely user friendly and approachable. There are some issues when downloading content when using an iPad Pro. If you have content that your people need, whether they are clients or employees, Bloomfire is for you. Your company can delegate who sees what content, is able to curate your content and break down those information silos that exist in all companies. We are housing our content, keeping it organized, and allowing our clients to access collateral they need on one platform! "Best Community Development Product by Far!" I love the search function and the mobility app the most. So user friendly and flexible for various learning and content management functionality. Also, their customer service level is off the charts. Their culture is strong and they truly show they care about me as a business in helping us meet our goals. They are so flexible and supportive as well. Only selfishly, I wish I could get some enhancements added faster but they are open to my suggestions for changes. I do recognize that I'm one customer of many and that they need to prioritize these suggestions. I do appreciate that they at listen and welcome ideas for changes/improvement. Bloomfire is a user-friendly social platform that enables users to post, question, and consume information in a "system" that helps drive engagement and learning. The mobility function via their app is fantastic and separates them from their competition and was a primary driver for us using their tool. Plus, their staff is customer-focused and responsive to our needs so you truly feel the value of the partnership. Content management to ensure the right information can be found faster and easier. "Finally, a user friendly tool that your users won't hate using!" User interface requires no training and is familiar to anyone who has ever used a computer. Administration is a bit more hands on than I'd prefer, but the client team is always available to jump in and take care of things for me when I'm too busy! We spend millions of dollars on research every year, and in the past, when employees left or moved teams, that research was lost forever and would sometimes even be redone. Also, traditional "folder" structure is not intuitive and wastes time uncovering the wrong documents. Bloomfire help's us organize all our research, keep track of it to avoid duplication, and saves users on average 20-30 minutes of search time. "You couldn't ask for a better and simple knowledge management system!" The layout is so well developed and easy to navigate. We in the e-commerce space know how valuable "tags" are for online businesses and the fact that they are being applied in the Bloomfire platform definitely gives us a sense of joy. The imagery and design of each contribution makes knowledge management fun and not a boring information library. I personally haven't had any issues with it thus far. We have only had the product for a few months and it has been great so far. As more information is populated and complex files get added, we may get a better gauge of some of the discrepancies. Business Problem: Our previous knowledge management system wasn't well administered, wasn't user friendly and wasn't leveraged to its full capacity. - People love to contribute in anyway possible and the use of the word "contribute" really was a great marketing play! "Categorization at its Finest "
Bloomfire has a very effective search mechanism that sifts through all existing articles and pulls articles with the requested title and/or keywords. Although it isn't perfect, I found that it does a very good job. Furthermore, the Series feature allows you to group documents that are relevant and still have them equally accessible, which isn't possible if you are simply using a database like DropBox or Google Drive. Lastly, the feedback portion ensures that writers are constantly being recognized for and improving their articles. Although I give the search functionality a lot of praise, it is not perfect. I also wish that Bloomfire could be made into more of a community than simply a resource; if I'm looking for a specific topic or article I can find it, but it is difficult to simply soak in information from articles that is relevant to my job, because the content is not curated in any way. Figure out the purpose of why you want to use Bloomfire; if it is simply to archive information, then it may be a better idea to go with a system like Google Drive or DropBox. However, if you are looking to create dynamic content that is easily accessible and will be visited often, look to Bloomfire! We work in the e-commerce sector, and therefore we are trying to make it easier for everyone, specifically high-volume merchants, to sell online. The benefits of Bloomfire is that it can be used as a database for our case studies, of which there are many, and we can categorize them using a number of criteria that make it easy to find on-the-go. "Excellent knowledge cpature tool that is simple and easy to use"
Search driven and easy to upload content to. Mobile integration means we can get alerts on new content which is great. Not much is bad about this at all - most staff use it without issue. If I was to pick one thing, it would be good to have a bit more version control tools, to avoid people uploading new versions of the same thing by mistake. But that's a minor niggle, not a major problem. Bloomfire is one of many tools that can support knowledge capture. We like it because its interface is simple and its search seems to cope pretty well with rubbish content. It's not fussy about uploads meaning that it's easy for anyone to contribute. I would recommend that others considering these types of tools trial them rather than just look at features. Usability is really important, and I think Bloomfire does well in its simple, clean interfaces. "Content rich portals provide information, project status and look ahead to upcoming events." Once you learn how to correct;ly build a community portal and seed it with good, useful information the project members naturally start to use it and then begin to add to it. If built correctly, the maintenance is low and new content grows naturally. When we send out the minutes of a project meeting, we just add the portal as a member of the project and the latest minutes magically appear under the 'Minutes' series. We do have overlapping projects and we have not found a good way to handle these overlaps. One way is duplicate posts but it would be nice to have a more formal way to handle two groups that have some information that's completely separate and other posts which are private to the group. We also need to manage groups of people and not just individuals. Most projects are staffed by teams in different groups and in different locations. Get all of your data organized into less than a dozen folders. Decide which data needs higher security, limited access, and when it should be removed. We put older data into an archive each month to keep the site fresh. We also make the project managers responsible for good, accurate and useful information. If there are bugs, problems, inaccurate data, etc. they get a not-so-nice call from our CEO. If there is great progress on the project and there is good information is on the website, then they get a nice call from the CEO. We needed a way for our different communities to easily collaborate. When the people of a community decide to transform a vacant lot full of trash into a community park, it works out better for everyone including the city. If people build the park themselves they will keep it clean because they are proud of it. If the city builds on its own, the park will likely not meet the needs of the surrounding people and it will deteriorate quickly if the city is responsible for maintenance. "A solid choice for smaller teams"
Bloomfire stores knowledge like a card in an index file. Each piece of information stands alone and then it adds powerful search features so that you can find all of those bits of information. The ability to group cards into a series really gives you the ability to focus the tool to enhance other forms of training. I also very much like Bloomfire's deployment. Being able to meet with one person who can offer insight on how best to utilize the software is very helpful and avoids a lot of the mistakes that are common when you first implement a new tool. I dislike the way categories behave when you have multiple groups defined. I also dislike the default html editor. I am importing a lot of technical knowledge and the html editor formats my text oddly. We did a traditional software selection process. We defined our requirements including what we had to have and what would be nice but we could live without. Then a team member surveyed a number of products and narrowed down to a couple that might suit our needs. We took advantage of Bloomfire's willingness to demo the software for us on multiple occassions and to multiple audiences. We compared features with other products. By the time we selected Bloomfire, we had significant buy in from everyone on the team that this would be a good tool for us to use. I believe that buy-in is more important than feature set. We also had a good definition of success -- which is 75% buy in. Bloomfire clearly stood out as our best option. We are a small team who need a knowledge base internally. Although Bloomfire is a powerful tool to have customer facing, we are using it primarily to keep track of our institutional knowledge and as a training tool for new employees. We haven't gone live yet, but we already have the benefit of thinking about our data and how to structure it to provide a pleasant and productive experience when using the tool. "Bloomfire for easy knowledge sharing"
My favorite thing about Bloomfire is a tie between the clean visual layout and the built in analytics! I'd really like more autonomy on what analytics I see, and how they are displayed. I think Bloomfire can be an awesome choice, but it's really important to have management buy-in and support. If your organization is large like ours, getting full participation may take a lot of time and effort, and it is really important to leverage social connections to improve participation. Our group does not currently have an LMS, and when we'd run accross information that might be beneficial to the organization, the only method of sharing said information on the fly was to email it out. Invariably, emails get lost in the shuffle, and can be hard to find on demand. Bloomfire allows us to tag important information with meaningful tags, and lets our users search and find them with ease. "Great product with a subpar API"
The best part of Bloomfire is the organization. It allows for simple access to information for all members of our support team. The groups and topics allow us to use a region for each group and make sure the relevant experts in that region are alerted whenever something in their subject matter is going on. Copying posts via the API is impossible, and the documentation around the content API is shoddy at best. The API often has issues with "content", as you have to directly interface with Amazon S3 which seems insane to me. The best idea there is to allow an endpoint yourself where you accept a file and deal with your own Amazon S3 in the back end of the API. In all honesty, the best recommendation is to reach out to Bloomfire for help as often as possible. Though sometimes Bloomfire support takes some time to get back to you, it's easier than trying to trudge through the API documentation. We are solving the issue of getting comms out to our agents as quickly as possible. Through an API integration and some permissions "cheats", we've been able to do this and bring a lot of info out to partner offices much faster. Unfortunately, since we weren't able to copy posts, we could only cross-publish. This means that we have a lot more admins in the system than necessary so they can edit the posts we cross-publish. "Great resource for sales teams"
I appreciate the ability to have a live content accessible within a controlled environment. We use it as a training resource mostly; sales teams will always have turnovers we needed an interactive environment to address all levels of seniority. We also use Bloomfire to share articles that keep everyone up to date within our vertical. I appreciate notifications regarding comments and updates too. The use of groups within our subscription has proven valuable too: we can share specific to content according to hierarchy. Also, tags make navigating the library we have built much more user friendly. I would say that while tags are helpful, they are not error-proof. User error can make an article get lost amidst the sea of content we have built. I still think editing outside of the UI and uploading is easier than editing within the UI. I appreciate the updates over the years to make adding links and such easier. We are solving resource and training issues with Bloomfire. Our team has created courses with reportable results that has helped tremendously. Admin features are invaluable. The benefits realized are up to date content sharing and discussions within a trackable environment. The Following feature helps teams stay up to date with more departmental matter too. In the past, I have had trouble searching for documents in another program. Bloomfire is so easy to use, and spot on every time for what I search for. The search engine is quick and accurate which is important to us. I also like the app for the mobile phone. It is just as easy to use as the website. This is handy when out in the community working. Honestly, I have not found anything I dislike. The program is easy to use to find documents or to publish documents. The search engine is quick and accurate. We have needed a location for our policies and procedure. We have realized this is a one stop shop to add all of our policies and procedures that is easily located by our employees. The employees are able to go on and search easily and quickly, and find what they need. Before, we could search a specific title, and it would not come up even though it was typed exactly as the title read. I also like the benefit of tagging a document for ease of use. "Bloomfire is a solid KM platform for medium sized teams"
Search is amazing. Post display is very clean, and usage is straight forward. User friendly for admins, creators and consumers. The linking system for "groups" is unintuitive. It creates separate URLs for each "post" in a group, and if a user is in multiple groups it isn't apparently WHICH group conversation / post version they are consuming. Also, if things change groups, etc, links are broken - ONE URL with a group filter for conversation would be a better design. Investigate if the group structure works for you - this can be something tough to wrap your head around, but is something that could be useful with a different hierarchy. As with anything, determine your needs/wants and then decide on solutions that fit. We had a lot of team tribal knowledge, process, etc, that needed to be organized to make our sales and merchant success teams more efficient. I like having the ability to bring together all of our customers and to have them collaborate among themselves and my team in an open forum area as well as private group areas. The mobile app needs some work. It is not as intuitive for my customers as it could be. They also have a tendancy to make changes to the system that can easily confuse non tech types. Simply do your research on their features to see if it meets the needs of your business. It has helped us fill a big gap in customer collaboration. We have always needed an open forum that lets our customers cross discuss our platform and services and this allows us to let them communicate, ask questions, and share documents and other media types. "One of the best platform for team collaboration across the globe. " I like that it is so intuitive and easy to use. But it is also supported by very clear and scalable workflow. So much flexibility in designing the portal means, you have to rely on designer to get it right. Pretty good for knowledge sharing. Sharing the knowledge and documents across various teams. "All hail Bloomfire, our savior." Having the ability to access any sort of information about your company at your fingertips in one central hub, allows you and your organization to increase productivity, streamline processes, and prevent the loss of time. At the beginning, it can get quite overwhelming knowing where and how to structure your company's knowledge base. This will be the biggest challenge. Once you overcome this challenge, everything is a breeze. Begin by tackling ONE sector of your company at a time instead of trying to add everything in at once. 1- Onboarding new employees has never been easier and so seamless. 2- Instead of spending time looking on HOW TO do something, spend that time actually doing it. 3- Allowing your team to work like a well-oiled machine by empowering with the knowledge about your business. "Bloomfire is a great tool for knowledge sharing"
Bloomfire is versatile and intuitive. I appreciate the ability to adapt the structure and look of the platform to fit our use case. I also like that users are able to really interact with the platform without hand holding. Sometimes the versatility also serves as a barrier to success. In order to make the platform useful for a broad set of use cases, it sometimes isn't optimal for specific needs. We utilize Bloomfire to support our sales organization. It has proven useful in increasing engagement among our sellers and content creators. The nature of our business also makes it difficult to identify who in the organization has the information being sought. The question feature has helped us to bridge that gap and also create a database of content for others. Very collaborative and helpful, simple, intuitive interface and good feature set. Easy to onboard users and adoption level was high. Pricing was transparent and fair. We reviewed many platforms and Bloomfire was the only one that had a great platform with just the right balance of features and an easy to understand site that would make onboarding our users a success. Could make integration and white labeling easier. We had issues with some of the features we wanted to implement. Would have liked to have seen some of the roadmap items that were promised released sooner as this would make achieving our objectives more realistic. Great product and company. Could be more flexible with integration but were helpful in making what was possible happen. Great addition to my client's intranet/DAM/Knowlegebase allowing for collaboration and interaction with related organizations across North America. We saw great interaction right away and user adoption was fairly easy. "Great team collaboration and centralized knowledge base"
We use bloomfire for our internal knowledge base. We are a team of 30+ software consultants that needs a centralized location to manage our knowledge and thought leaderships to quickly solve our client's needs and lead them to best practices. Bloomfire helps us manage our dense knowledge base and allows new hires to access knowledge easily and quickly. The hierarchy for series versus posts can be confusing for structuring content. The search on Bloomfire is amazing, but when you are trying to organize information in a very structured order, the series are your only approach. It would be great to have a hierarchy above series as a "parent" series to house a number of smaller series that each have individual posts. We are systematizing how knowledge is digested and shared across the organization. We have seen a speed in questions answered and through gamification, we are able to increase the responsiveness and participation of our team with the content. It has improved how quickly information is accessed and used to solve our client's needs. Bloomfire is best for the ability to help communities keep in touch in both formal and informal ways! The user interface is a big plus, bringing a fresh look on communication tools. For example, we have stopped using the Salesforce Chatter function because we moved our communications to Bloomfire, which offers better storing and sharing capabilities. The search feature can be slow at times and it doesn't always sort the results in the most efficient order. The page sometimes takes too much to load, making the process of retrieving the right post a bit harder than it should be. If you have a community of users that you are looking to communicate with, choose Bloomfire! I work as a Salesforce database administrator, so I have to also train people on how to use the platform. Bloomfire is the easiest way to provide offline support. I use the Bloomfire post I created each time I speak to one of our employees in the follow up, so they can have the written or visual part of the support available at anytime. We encourage our employees to leverage Bloomfire as much as possible. This way we make sure that we are not being asked the same question twice by the same user, because they will have access to the written post or the video on Bloomfire. This streamlines the support process and offers flexibility to the users as well. "Bloomfire, easy to setup, hard to get buy in"
Bloomfire is Easy to upload content. Simply drag and drop for documents and they're there. Groups and Categories are easy to configure, and searches are straightforward. The control of the main page is nice, we've added links for all our internal web-based tools for our staff. Setup and Admin of the product were both easy. Tag and Image management are a problem. They are definitely missing an image library so that authors can have easy access to current corporate graphics. Tags proliferate based on which user(s) are uploading content to the point that they lose much of their effectiveness. In general managing the content or controlling it are difficult and can require full-time engagement. Consider the volume of content you will have to manage. Carefully consider whether your site will be internal or external. We were hoping to consolidate information off of network drives and to get them onto a single searchable platform. Simply getting the business to upload their content and convert is the biggest difficulty facing the tool. Our benefits have been more limited than expected due to that issue. The best part is the ability to do anything with a new article while also being extremely easy and accessible. Adding gifs, links, and graphs is a simple as dragging the icon to the page. The ability to search through the knowledge database has been extremely useful to our agents, as it allows a large library to be easily filtered through. Sometimes the interface looks a little plan with just the white background and black box outlines. Also, I wish there were more options in terms of email digests. The lack of timestamps on comment edits (or a symbol stating that something was edited) is also disconcerting. Try testing out all of the different uploads within a doc and utilize the tagging as much as possible. There is such a thing as too few and too many tags, so try to make them appropriately specific AND general to allow both a large filterable knowledge base and also an easy way to find exactly what an agent is searching for. Try to have a good format in place for editors and posters to use. In addition, make sure to have a separate set of icons available to each article to help distinguish between different subsets of articles visually and easily. We are solving the need to have a large amount of information accessible to a large workforce working varying hours. This has allowed us to disseminate information to those who might have missed it before and has decreased errors and repeated questions. "Bloomfire - Practical Content Management for Many Use Cases "
Simplicity, Robust Functionality, Affordability even for scale, Maturity. Many content systems focus on solving the problems of one business function or use case. Bloomfire is useful for many common sales, marketing, training, HR, community business functions, users and their use cases. Simplicity means general users can create web pages, insert documents of any kind from any online source or through upload. But it also manages links to articles. Pages can include images and video - even self-recorded webcam video. Functionality means content can be organized for many purposes, grouped for specific audiences and communities. Beyond management, it's a full collaboration system to comment and request content assistance. Affordability means you don't have to choose between (near) free generic platforms that you have to develop into usable applications, and expensive, fully functioning specialty applications. Bloomfire's business model fits in-between, with pricing designed to accommodate scale. Maturity means these folks have been at this for awhile, and the system is robust, with feature enhancements well in the "nice to have" category, more than "must have". I'm sure there are little nits that frustrate me. But I'm hard pressed to name them. I always like to see more robust tagging capability, because as content volume grows, search becomes so important. I'd like to see delivery with tracking and notification included somehow. Pages can be public, and can be shared, but tracking requires users to be registered (paying) as part of the "community". This system must be on your short list. Defining content use case requirements is part of our business. It's important to define specifically the use cases, and associated functionality, required of any of the many communication, content and collaboration systems that are available today. We use this application for general content management, sales enablement, and training. Since it's fast and easy to add content to pages -- in many different ways -- it's easier to capture, file and tag 3rd party (articles or documents) as well as our own, into one central repository. We continue to put document files in Box (legacy) but use Bloomfire as a front end. So this saves time curating and finding content assets. We find them easier, therefore use them more frequently than with Box or internal file storage. Content is now a real asset for us. We also refer clients to Bloomfire when working on content operations projects. I love the ease in which you can post a contribution. We use Bloomfire for both internal company information as well as client facing ancillary support information. I wish there was more control over how the site sorted the information. I'd like to force position the contributions instead of have it based on use. Our clients need more structure to find exactly what they need. Evaluate if your team is going to be interactive. If yes then this is good. If not then you might consider a different platform. Bloomfire is easy to use, easy to post and easy to follow posts. If nobody is engaging then it's not worth the time. We're solving the need for being able to answer generic questions from clients. The benefit is that instead of re-writing the same answer again and again, we can simply send a link to the solution or video. I really like how posts are created and managed. When you create a post or entry, you can hide it, review it, make modifications, add collaborators, and then publish it again, seamlessly. I would love a better search engine, sometimes things that are a great match, the search engine put that at the bottom of the results, that's weird. Be consistent, start creating content correctly from scratch, remember that the real value of this product, is its contents. We publish commonly used documents, for internal purposes, which a really reusable and valuable to the people using them. It is a great repository for standard documents, and templates as well. Bloomfire is incredibly easy to use and navigate. It's uncomplicated and information you're searching for immediately populates. If the information is not readily available, it's easy to pose a question to the entire company, or select individuals, so many people can benefit from the information and have it available for any future questions. I'm not sure there's actually anything I dislike. We've had a few small issues with outdated pieces that we've forgotten we've uploaded after a year or so, but I'm sure that's an easy fix if we take more time with Bloomfire. We've always had issues with information sharing across teams in our company. As one of our teams is remote, there's an added difficulty. Bloomfire has been great as a place to house all necessary information and make it available to anyone within the company at any time. "An innovative tool, integral to our team participation culture"
Bloomfire has a sleek design which is very user friendly. The ease of learning the Bloomfire platform and navigating throughout is a great benefit. There are seemingly small features that we have been asking for, but have yet to see progress made. The ability to transfer ownership of posts to another (existing or new) user is super important for team member succession and turnover. The benefit we were seeking when we moved to Bloomfire is still the benefit we reap today: knowledge sharing. Bloomfire provides a way for our staff to access documents, search for content and ask/answer questions, across time zones and across the world. Your platform help us to share news, presentation and information regarding to our community! It's a great program and user friendly. It puts all your information right at your fingertips without having to spend hours looking for things. The search bar is very efficient. Sharing of everyday processes is so much simpler - everyone can be looking at the same page with you and know exactly what is happening/when. "Great product with easy navigation "
Unless registered, users cannot ask questions. At Swept, we are looking for a way to booth engagement from users. A feed feature might be a great feature to see within Bloomfire. Having training assets (how to articles and videos) available for our customers 24/7 is a key for our company's success. Bloomfire made that easy for us! Thank you! In addition to that, we also use Bloomfire to keep our team informed of any updates. Works great for this too! Bloomfire teaches you to build a real estate model step by step, which is very practical for students. There also have the document to download to help you study.They response your question very quickly.I really like to recommend to my friend. It’s good for students to starting your modelling skills.However, when you go to the industry,there aren’t enough vedios to go to the high leverl modelling skills. I love the simplicity of the interface. Most users can post and ask questions without being trained on the program, allowing information to be shared easily. It's very simple to add documents, pictures, and videos to posts. I love that it reflects tools users are comfortable with from social media: high fives for content you like, tags, and profile pictures. Not much to dislike, but I'd like to see more options for tagging and attaching media in the comments, as that's sometimes where the real answers are found. We use bloomfire as a forum for process related questions. Branches across the nation can interact and share questions and information. Trainers and corporate users are able to post updated content and answer questions so that the entire company can be on the same page with the latest information. "A functional platform for information sharing"
It's an easy to use platform to share documents between a team. I like that you can ask questions and suggest a post to someone, which makes it more interactive than just a place to keep docs (like google drive). Documents can be hard to search for if you don't remember what they are called (can't search by keywords). It allows our company to share data between employees and direct people towards one centralized place where information can be found. It saves HR supervisors time by not having to answer individual questions from employees, but rather direct them to a resource where they can find all the information they need. * We monitor all Bloomfire reviews to prevent fraudulent reviews and keep review quality high. We do not post reviews by company employees or direct competitors. Validated reviews require the user to submit a screenshot of the product containing their user ID, in order to verify a user is an actual user of the product. Hi there! Are you looking to implement a solution like Bloomfire?